Changes are looming for the country’s “energy capital” New Plymouth, but ongoing affordabilty means the city remains full of investment opportunities, discovers Miriam Bell. 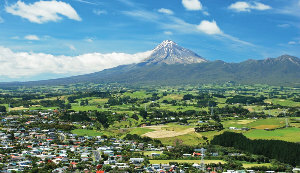 Taranaki is home to all of New Zealand’s producing oil and gas fields and at its hub is New Plymouth. Long known as the country’s “energy capital”, New Plymouth is a bustling city built on the back of the oil and gas exploration and production industry. That has made it a magnet for workers and for those keen to provide services, such as housing, to workers. Recently, the government’s announcement that it would be ending new offshore exploration permits and restricting onshore exploration has cast a shadow over the oil and gas industry – and over New Plymouth. In turn, some have concerns over what it could mean when it comes to investing in New Plymouth property. Yet the looming changes shouldn’t ruffle as many property investment feathers as it might initially appear. Local commentators are confident in the city’s economic future and point out that its housing market retains key attractions for investors. These include affordable prices, good yields and the potential for solid growth. When looking at the New Plymouth market, it’s hard to go past the affordability of its prices. The latest QV House Price Index has the city’s median property value at $444,814 in April. It also shows that values grew by a decent, although not spectacular, 6.3% in the year ending April 2018. While this is lower than some regional cities, it is still considerably better than most of the main centres. Taranaki Property Investors’ Association president Lew Sarten agrees that New Plymouth’s affordability, in direct contrast to the main centres, is attractive. An investor’s money is going to go much further in comparison to somewhere like Auckland, he says. It is worth noting, however, that although prices have come back a little of late, which is good for buyers, there are some supply issues. Long-time New Plymouth investor Lois Goodman says there is a shortage of properties at the lower end of the market. Affordable house prices and good returns aside, New Plymouth is regarded as an attractive destination. It’s situated right by the sea, overlooked by the mountains and surrounded by nature and parks – which means it offers a host of lifestyle options. This is enticing for many, as reflected in the growing population. But it is New Plymouth’s solid economy that has always been the drawcard for investors. The backbone of that economy has always been the oil and gas industry. And that means there is now an elephant in the room: the future of the oil and gas industry and what that means for the city’s housing market. Malcolm says there is no denying that the oil and gas industry is a big driver for the New Plymouth economy and housing market. But he doesn’t think the city will lose its position as “energy capital”. The infrastructure that has grown up around the oil and gas industry has also produced several large and well-established support industries. These include engineering and transportation sectors and New Zealand’s only West Coast deep-water port. All of these are now solid economic drivers in their own right. Dairy is another big economic driver for the region. Fonterra’s huge, recently redeveloped Whareroa production site is in nearby Harawera. TSB is also based in New Plymouth and the city benefits from a healthy tourism industry and a growing events industry (driven by the likes of WOMAD). In Sarten’s view, this all makes for a strong economy – quite apart from the oil and gas industry. He says the situation with oil and gas permits has been hyped up but that, in the short term, he doesn’t see it having an impact on the property market. Additionally, the government has committed $20 million to help future-proof the Taranaki region by diversifying its economy, creating additional jobs and leveraging off the base established through its oil, gas and agricultural sectors. There’s also a lot of development planned for the city in the coming years, Sarten says. As examples, he cites the building of a new retail complex with 30 shops, a hotel and a cinema, along with the redevelopment of the TSB Stadium, the Todd Energy Aquatic Centre and New Plymouth’s airport. Geographically, New Plymouth is in a relatively isolated position. This, combined with the type of industries that drives its economy makes for a steady flow of people relocating to the city for work. That means the rental market is stable and strong and poised to remain so. Feron Property Management director Chris Feron says the city’s rental market can be divided into three streams. One is the core, mainstream market, one is the lower-end market and the other is the niche executive market. Each of these commands different average rents, with the executive stream attracting higher rents. According to Realestate.co.nz, New Plymouth’s average weekly rent was $358 in April. But Feron gives the breakdown of average weekly rents across the core market as $250 for a two bed house, $360 for a three bed house, $414 for a four bed house and $300 for a townhouse. In contrast, the executive market – which caters to high earning professionals arriving on contract – is less reliable. Feron says the market is variable and goes up and down like a yo-yo. For Goodman, who has been a landlord for around 20 years, New Plymouth’s rental market has always been a reliable one. But, she too says, it is noticeably strong at the moment, in part because there is a shortage of rental accommodation. There is high demand for two bed, low maintenance rental properties and she wishes she had more of them in her portfolio, Goodman adds. Buying well is key to making a good investment in New Plymouth. To this end, it’s best for investors to look for properties in a lower decile area which has cheaper prices and provides good returns, but also has the potential for growth, Malcolm says. He picks suburbs like Westown, Frankleigh Park, Merrilands – all of which are close to the CBD – as likely to provide good returns. But when it comes to suburbs with good capital growth prospects, he suggests Merrilands again, along with Fitzroy, Strandon and the satellite settlement of Oakura. Some areas are particularly desirable when it comes to rental properties, Feron says. He names Vogeltown, Welbourne, Westown and Inglewood for those interested in less central suburbs.